The Bederia, also called the Bideryia, are one of the numerous Baggara tribes of northern Sudan that share many cultural characteristics and claim a common ancestry. All of them speak an Arabic dialect known as Baggari that can be understood by both Arabic and Sudanese Arabic speakers. Their name comes from the Arabic word bagar, which means "cow," and refers to the various Arab tribes in Sudan (and surrounding nations) which raise cattle. These Baggara tribes live in the plains of Sudan's Darfur, North Kordofan, and South Kordofan provinces. The region is well suited for grazing cattle and varies from sparse scrub lands in the northern areas to arid and semi-arid wilderness lands to wooded fields. It only rains during the wet season, primarily from June to September. The Baggara have traced their origin back several centuries to the days before Mohammed. They claim to be connected to the Juhayna of the Hejaz (region of northwestern Saudi Arabia). Over the centuries, they have become widely scattered across the plains of North Central Africa. Different groups tend to be concentrated in certain regions, but there are no purely Baggara areas. Most of the Baggara are herdsmen. Their herds are comprised primarily of cattle, although they do raise a few sheep and goats. Camels are kept for riding and as pack animals. The nomadic Baggara live in camp units called furgan. Members of the furgan generally belong to one or more family line. The Baggara live in simple, dome-shaped tents, which are portable structures that can be easily packed and moved with the herds. The tents are built by placing saplings into holes in the ground, then bending them over and tying them at the top. Smaller branches are tied into the frame, and then covered with thatch or canvas mats. The tents are arranged in a circle, into which the cattle are brought for the night. Although most Baggara tribes are nomadic, there are some that live in farming communities or towns. Their houses are built of mud bricks and have thatched roofs. Corrals for the young animals are built inside the compounds. Grazing land is usually shared, but farm land is owned individually. The Baggara are somewhat unusual in that the women work to provide the income needed to maintain the households. They earn cash by milking the cows and selling the milk or milk products. Their earnings are either kept or spent on household items. A married woman owns the tent as well as all of its housekeeping contents. The men are primarily involved with caring for the herds. They also plant and harvest the crops. Baggara marriages are often polygamous. If a man has two wives, one may live in a pastoral camp, while the other lives in a farming village. Cross cousin marriages are preferred. A "bride price" is provided by the future husband and his near relatives. Part of this money is used to purchase household items, while some of it is used to buy food for the marriage celebration that takes place in the bride's camp. After the wedding, the newlyweds live near the bride's parents. Later, they move to a place chosen by the husband. On this occasion, the groom's family provides another feast. Baggara society is patrilineal, which means that the line of descent is traced through the males. Traditionally each camp is headed by a male leader called shaykh. Although this position is generally inherited, all of the adult male members of a camp must agree on the man who is to fill the position. The shaykh does not rule the camp, but rather acts as the spokesperson for the decision-making males of the camp. However, he may also have a considerable amount of influence, depending on his wisdom and economic status. 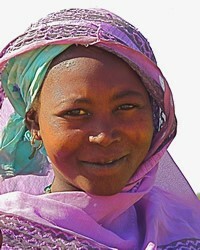 The Baggara tribes are virtually all Muslim. Eight of the groups are Sunnis, while the others belong to the Malikite sect. All of them faithfully observe the "five pillars of Islam." Many of the men and some of the women are able to make pilgrimages to Mecca. The Baggara hold various religious celebrations and also place importance on many life stage transitions. Very little evangelization has been done among the Baggara tribes. Because the people are so devoted to the Islamic faith, very few Baggara have converted to follow Jesus. In addition, the nomadic lifestyle of many of the Baggara makes it very difficult for missionaries to reach them. There is a great need for qualified laborers to live and work among these Muslims. Concentrated prayer and evangelism efforts are necessary in order to reach their hearts with the Gospel. * Pray that God will raise long term workers to join those who have already responded. * Ask God to encourage and protect the small number of Baggara Muslims who have become Christians. * Ask God to raise prayer teams to begin breaking up the soil through worship and intercession. * Pray that the Christians living in Northern Sudan will be stirred with vision for outreach and a genuine burden to reach out to the Baggara tribes. * Ask the Lord to raise strong local churches among the Baggara.View Bederia in all countries.